The San Diego Lapidary Society is a member-owned and operated private non-profit [501 (c)(7)] organization. Becoming a member of SDLS means that you not only have the opportunity to join in all the activities, services, classes and events of the society, you also become part owner in a community of artisans and craftspeople. 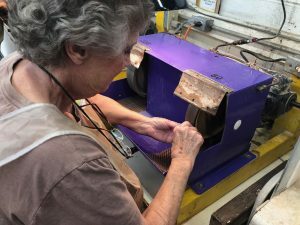 The San Diego Lapidary Society is a member run organization, meaning that along with membership fees, members are asked to assist in care and function of the facility. The process to become a member is simple. Individuals who are interested in gaining membership must come into the shop for an interview by an officer of the SDLS Executive Board. While here, you are given a tour of our facility along with a brief history of the society. Prospective members are then given an application which can be filled out and handed in at that time or returned at a later date. All prospective members must be sponsored by a member of the society in good standing. The application then goes before the Executive Board who renders a vote. This process can take anywhere from a couple days to a week depending on the assemblage of the board. After a member is voted in they are asked to pay the applicable dues, given a membership card and instruction can begin. Annual dues are $45.00. Anyone joining before June pays only for the current calendar year. Anyone joining after June pays for the remainder of the calendar year and the following year. One (1) additional adult individual of the same household may be added on to the primary membership at $12.00 for the calendar year. Minors in the same household may be added for a fee of $10.00 per individual. Flat shop usage fee is $6 for members. Non-members may not use the shop unless they are accompanied by a member in good standing. 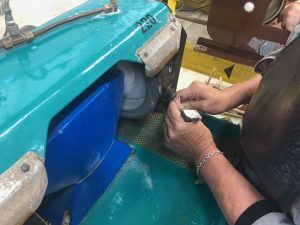 This fee covers general cost to run the shop (replacement of saws, sanders, grinding wheels, etc.). $2.00 This fee covers general cost to run the shop (power, water, etc.). After being accepted as a member of the San Diego Lapidary Society you will be given an orientation and instructed in the art of cabochon making will begin. Instruction and your first shop session are free. All open shop time thereafter costs $5 per three-hour session regardless of how much of that session is actually used. As a condition of membership all new members are required to successfully complete two cabochons before going on to other projects or activities. Depending on the student, this usually takes no more than two or three sessions. All new members are given basic instruction in making cabochons and how to use and care for the shop and equipment. After completion of two cabochons a member is free to participate in other classes and activities and pursue their own projects. Member taught classes. 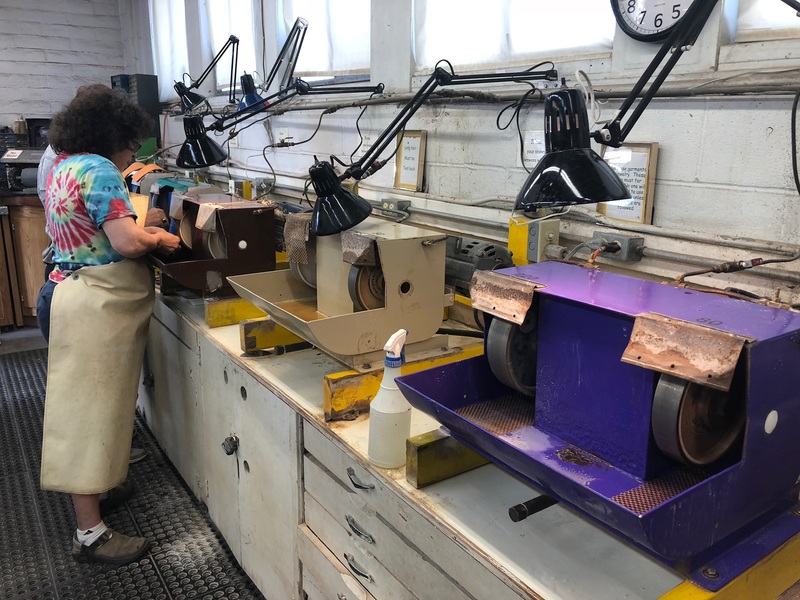 Past classes have included: silversmithing, faceting, stained glass work, wire-wrapping, silicon molding, lost wax casting, metal etching, chain mail and more! Field trips. Past field trips have been to mine for tourmaline, historical gold mine tours and museum expeditions.